Disney On Ice Presents Frozen - My Review of the Show! Disclosure: I received complimentary tickets to see Disney On Ice Presents Frozen, but all thoughts and opinions are my own. Since it first opened in 2013, Frozen has been an undeniable part of modern culture. Its place in children’s hearts hasn’t waned in the years, and no place is that more true than at Disney on Ice Presents Frozen. 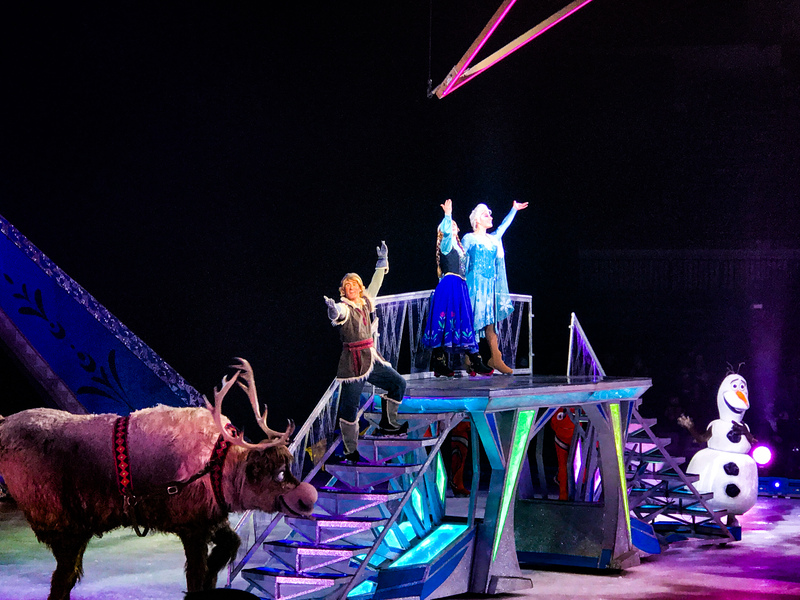 While other presentations by Disney on Ice focus on a variety of stories and themes involving favorite Disney characters, this performance is dedicated to the retelling of the smash hit on the most appropriate stage: a frozen ice rink. The night begins with Mickey, Minnie, and more of their Disney friends gathering on the ice to introduce the story of Queen Elsa and Princess Anna. Split into two acts (with one intermission) we watch the tale of Elsa, cursed with magical ice powers. When she loses control of her powers and accidentally freezes her kingdom of Arendelle, it’s up to her estranged sister Anna, a rough-necked ice salesman named Kristoff, and an enchanted snowman named Olaf to find her and try to bring back summer. Each scene of the memorable story is told through lovely ice-dancing, original music, and even some surprising special effects. Set pieces transform on the ice and ice dancers portray all the characters in the story — yes, even the four-legged reindeer Sven. Firework effects and lights represent Elsa’s ice magic while video screens above the ice change with each scene. The show is an absolute delight for all families, entertaining children and parents alike. My daughter was transfixed to the action on the ice the entire evening and sang along with every song, dancing the whole time. The audience was filled with all ages of children, dressed as Elsa and Anna, simply loving the icy recreation of their favorite film (Including my daughter who dressed as Anna and her friend who dressed as Elsa). The show is now playing in Southern California (Long Beach and Ontario). You can find out ticket information for Disney On Ice Presents Frozen here, plus get a 20% discount on select ticket dates! Puppy Dog Pals DVD Now Available! Have a Disney ZOMBIES Movie Night!